The recipe for this cake is from 1930 and it is said that the cake was called a princess cake because the princesses of Sweden loved it so much. It’s lovely to have with coffee, though I recommend only a little slice because it’s super sweet and sickly! You will also need some marzipan and whipped cream and maybe some icing sugar too! 1. Cream the butter and sugar in a large bowl until smooth. Then add one of the eggs and make sure it is fully incorporated into the mixture. 2. Little by little add the flour, baking powder, remaining egg, lemon zest and juice and mix fully. 3. The mixture should barely cling to the spoon. At this point you should add the milk, if it’s too dry. 4. Bake at 180°C for about 25 minutes in an 8 inch tin and cool on a wire rack before filling. 1. Whisk the eggs and sugar over a bain marie until fully incorporated and then whisk continuously for about 2 min's until frothy. 2. Now gradually add the milk and vanilla pod and keep gently whisking until the custard begins to thicken. 3. Remove from heat and cool fully. 1. Cut the sponge so that you end up with 3 layers and spread a layer of whipped cream onto the first layer. 2. Place another sponge layer over the cream, then cover it with the cooled custard. 3. Next place the final sponge layer over the custard, then add a generous layer of whipped cream over the top. 4. Roll out your marzipan so that it’s at least three times the size of the cake and cover the entire cake. 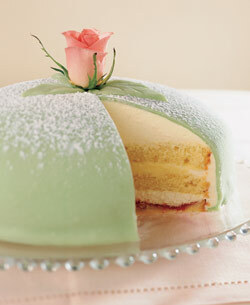 Traditionally the marzipan should be green and a marzipan rose is usually placed on top. I recommend sprinkling a little icing sugar over the marzipan to make it even prettier! I took and modified the recipe slightly from this website. Please view it there too if you decide to make this cake, especially since there is a cupcake version. Also, I haven't tried to make this myself, it might make more sense to divide the cake mixture between two tins, one with enough to divide the cake in half, and another with enough for one layer. God, it looks gorgeous, but I can feel the calories piling on just looking at it! But sure does look and sound yummy! They sell them at Ikea and they are wonderful and much easier to buy and enjoy. Baking is hard here at this altitude, 6200 feet. Woah there. That looks beautiful and I say this as someone who likes neither custard or marzipan. The marzipan would put it over the top! I'll take the rest of it, though! Okay, I'm making this cake sometime this summer. I love the sponge/custard combination. Marzipan is not my favorite, but maybe I can work around that, perhaps with fondant or something. It's so beautiful Thanks for sharing! That looks AMAZING!!!!! What's caster sugar though? Also, am allergic to almonds so I couldn't use the marzipan either. That is one pretty looking cake. My sweet tooth wants a bite! And FONTA got a RGYFR - RGYCO- RGYCA. That led to MELSO - ERESO- QUARSO. So they got all the mob rings and connections to NETHERLANDS. And that includes DOT- GORE- THOMAS. But the joke is that KARL ROVE and EDWARD MEESE were the first to turn a year ago. They've been moles with CARON. That's straight from " YOUREATE".